When Cathy, an experienced foster carer, agrees to look after Jade - a homeless pregnant teenager - she has little idea what she has let herself in for. Although pregnant Jade drinks heavily, stays out all night, smokes and gets into trouble with the police. When the baby is born Jades behaviour doesn’t improve and the social services take steps to remove the baby and place her for adoption. 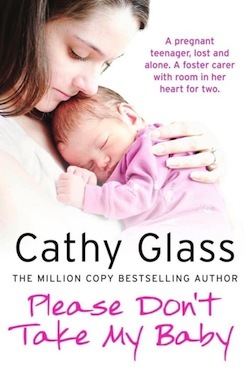 Cathy is devastated at the thought of a young mother being forcibly separated from her baby, but is there anything she can do to help, or is it too late? England has the highest teenage pregnancy rate in the developed world and while this is the story of one of those teenagers – Jade – it could also be the story of many. "Amazing! Gripping! Emotiona! Another wonderful book by Cathy Glass. She never fails to deliver on her true life stories. Had me hooked from the first page and by the next day I had finished it. " "Another fantastic book from my favourite writer. I could not put it down. I really hope there will be many more books to come from this amazing woman. Thank you very much for another powerfully emotional story." "Congratulations on reaching No 1 in the non-fiction charts. Well deserved. " "Great job, Cathy Glass. Keep doing what you do and I'll keep reading. " "Fantastic book. Read it in one sitting. I couldn’t put it book." "Excellent read, Cathy Glass is such a joy to read and this latest is a page turner. Loved it! "